A whole new way to use detailing clay! The Wolfgang Polishin' Pal Clay Kit will revolutionize the way you clean your vehicle! The kit includes Wolfgang Elastic Poly Clay, our premium synthetic detailing clay, Wolfgang Clay Lubricant, and the Wolfgang Polishin' Pal to make claying easier than ever. This kit includes everything you need to deep clean and decontaminate your vehicle's paint in preparation for the perfect finish. Why should you use detailing clay? Because paint that looks clean may not feel clean. If you run your fingertips over the paint and feel grit, that's airborne pollutants that are stuck in the paint. Over time, oxidation develops at each of these points where the paint has been breached. Only detailing clay removes these contaminants and leaves the paint slick and smooth. A coat of Wolfgang Deep Gloss Paint Sealant or Wolfgang Fuzion Estate Wax will maintain the glossy shine with polymer protection. The Polishin' Pal is an ergonomically shaped urethane handle that holds specially designed foam pads using hooks & loops. By gripping the handle instead of the pad, your hands don't get so dirty and the shape of the Polishin' Pal relieves hand strain. You can comfortably polish and wax your vehicle by hand without the fatigue you usually feel in your fingers. The Polishin' Pal Clay Disc enables you to clay without getting clay residue or lubricant on your hands. One side of the disc has hook and loop fasteners to attach to the Polishin' Pal. The other side of the disc is smooth and slightly sticky in order to hold the clay. The discs are reusable and clean up with just a little spritz of clay lubricant. Elastic Poly Clay is unlike other clays in formulation—the latest research and technology in car care has gone into this product. This formula is superior at attracting and exfoliating dirt, allowing the clay to glide across the surface with little to no effort, and keeping the clay supple and pliable. It packs great cleaning power—enough to remove stubborn tree sap, tar, acid rain, and water spots without harsh chemicals or abrasive particles. Use with Wolfgang Clay Lubricant. When applied on a freshly washed surface, Wolfgang Clay Lubricant creates an ultra-slick, protective layer between the paint and the clay. This allows the clay to glide across the surface, acting as a magnet for any foreign particles left behind after the wash. When this step is complete, your car's surface will actually be exfoliated, purified, and free of contamination. Your Polishin' Pal isn't just for claying! 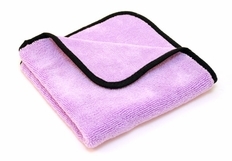 Use it with a white pad to apply pre-wax cleaners and glazes, or to give your wax a touch of cleaning power. The white pads are dense enough to gently polish the paint without abrading the clear coat. The pads secure to the Polishin' Pal with hook & loop fasteners found on the pads and the Polishin' Pal. Use these pads with Wolfgang Paintwork Polish Enhancer prior to wax application. With the Wolfgang™ Polishin' Pal Clay Kit, claying your vehicle is easy! And when you're done removing the embedded contaminants, you can polish your paint to an even brighter shine with the included pads. Important: Use clay only with an approved clay lubricant, such as Wolfgang Clay Lubricant. The lubricant makes the surface slippery in order to reduce friction between the clay bar and the surface. Rub clay across lubricated area only and re-wet as needed. When used as directed, clay will remove contamination from paint, glass, and chrome without causing swirls or scratches. A total retail value of $88.93. Save $28.94!